فرخ آبادی, امین, نقدی نسب, محسن. (1395). بررسی مایکرومکانیک جدایش الیاف- ماتریس و رشد ترک‌های ماتریسی به‌کمک مدل ناحیه چسبنده و روش المان محدود تعمیم یافته. علوم و فناوری کامپوزیت, 3(1), 21-30. امین فرخ آبادی; محسن نقدی نسب. "بررسی مایکرومکانیک جدایش الیاف- ماتریس و رشد ترک‌های ماتریسی به‌کمک مدل ناحیه چسبنده و روش المان محدود تعمیم یافته". علوم و فناوری کامپوزیت, 3, 1, 1395, 21-30. فرخ آبادی, امین, نقدی نسب, محسن. (1395). 'بررسی مایکرومکانیک جدایش الیاف- ماتریس و رشد ترک‌های ماتریسی به‌کمک مدل ناحیه چسبنده و روش المان محدود تعمیم یافته', علوم و فناوری کامپوزیت, 3(1), pp. 21-30. فرخ آبادی, امین, نقدی نسب, محسن. بررسی مایکرومکانیک جدایش الیاف- ماتریس و رشد ترک‌های ماتریسی به‌کمک مدل ناحیه چسبنده و روش المان محدود تعمیم یافته. علوم و فناوری کامپوزیت, 1395; 3(1): 21-30. یکی از موارد مهم درباره رفتار کامپوزیت‌ها در شرایط بارگذاری مختلف، پیدایش و رشد مودهای خرابی متنوعی است که دارای تأثیر بسزایی بر نحوه عملکرد آن‌ها هستند. مود خرابی مربوط به جدایش اتصال بین الیاف و ماتریس را می‌‌توان جزو اولین موارد در پیدایش خرابی در کامپوزیت‌های مختلف دانست که متعاقب آن و یا به‌صورت هم‌زمان، مودهای خرابی دیگری هم‌چون ترک‌های ماتریسی نیز به‌وجود می‌آیند. در مقاله حاضر با استفاده از مدل ناحیه چسبنده و المان محدود تعمیم یافته و با اعمال بارگذاری عرضی بر المان‌های حجمی نماینده در فاز مایکرومکانیک، اثرات پیدایش و رشد خرابی‌هایی هم‌چون جدایش بین الیاف و ماتریس، و ترک‌های ماتریسی مطالعه شده است. بدین منظور، در ابتدا رفتار ناحیه چسبنده بررسی شده و با شبیه‌سازی نتایج مربوط به جدایش الیاف از ماتریس در مقالات گذشته، روش طراحی صحت‌سنجی شده است. سپس اثرات مدل ناحیه چسنده در المان‌های حجمی مختلف مطالعه و نتایج آن‌ها با یکدیگر مقایسه می‌شوند. 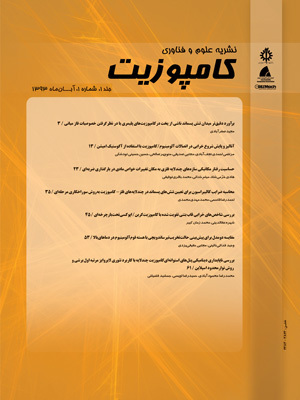 در ادامه با وارد کردن اثرات مربوط به پیدایش و رشد ترک ماتریسی با استفاده از روش المان محدود تعمیم یافته، اثرات ناشی از خرابی ناحیه چسبنده و ترک‌های ماتریسی به‌صورت هم‌زمان با استفاده از روش المان محدود و نرم‌افزار آباکوس مطالعه می‌شوند. Taib, A. A. Boukhili, R. Achiou, S. Gordon, S. and Boukehili, H., “Bonded Joints with Composite Adherends. Part I. Effect of Specimen Conﬁguration, Adhesive Thickness, Spew FIllet and Adherend Stiffness on Fracture,” Int J Adhes Adhes, Vol. 26, No. 4, pp. 226–36, 2006. Kim, K. S. Yi, Y. M. Cho, G. R. and Kim C. G., “Failure Prediction and Strength Improvement of Unidirectional Composite Single Lap Bonded Joints,” Compos Struct, Vol. 82, No. 4, pp. 513–20, 2008. Gonzalez, C. and Llorca, J., “Multiscale Modeling of Fracture in Fiber-Reinforced Composites,” Acta Mater, Vol. 54, No. 16, pp. 4171–81, 2006. Vaughan, T. J. and McCarthy, CT., “Micromechanical Modelling of the Transverse Damage Behaviour in FIbre Reinforced Composites,” Compos Sci Technol, Vol. 71, No. 3, pp. 388–96, 2011. Vaughan, T. J. and McCarthy C. T., “A Micromechanical Study on the Effect of Intra-Ply Properties on Transverse Shear Fracture in Fibre Reinforced Composites,” Compos A: Appl Sci Manuf, Vol. 42, No. 9, pp. 1217–28, 2011. Kanoute, P. Boso, D. P. Chaboche, J. L. and Schreﬂer, B. A., “Multiscale Methods for Composites: a Review,” Arch. Comput. Meth. Eng, Vol. 16, pp. 31–75, 2009. Geers, M. G. D. Kouznetsova, V. G. and Brekelmans, W.A.M., “Multi-Scale Computational Homogenization: Trends and Challenges,” J. Comput. Appl. Math, Vol. 234, pp. 2175–2182, 2010. Berger, H. Kari, S. Gabbert, U. Rodriguez, R. R. Bravo, C. J. and Guinovart, D. R., “A Comprehensive Numerical Homogenization Technique for Calculating Effective Coefﬁcients of Uuniaxial Piezoelectric Fibre Composites,” Mater. Sci. Eng. A, Vol. 412, pp. 53–60, 2005. Mahmoodia, M. J. and Aghdamb, M. M., “Damage Analysis of Fiber Reinforced Tialloy Subjected to Multi-Axial Loading – a Mmicromechanical Approach,” Mater. Sci. Eng. A, Vol. 528, pp. 7983–7990, 2011. Xia, Z. Zhou, C. Yong, Q. and Wang, X., “On Selection of Repeated Unit Cell Mode and Application of Uniﬁed Pperiodic Boundary Conditions in Micro-Mechanical Analysis of Composites,” Int. J. Solids Struct. Vol. 43, pp. 266–278, 2006. Correa, E. Mantic, V. and París, F., “A Micromechanical View of Inter-Fibre Failure of Composite Materials under Compression Transverse to the Fibres,” Compos Sci Technol, Vol. 68, No. 9, pp. 2010–21, 2008. París, F. Correa, E. and Mantiˇ, V., “Kinking of Transversal Interface Cracks between Fiber and Matrix,” ASME Trans J Appl Mech, Vol. 74, No. 4, pp. 703–16, 2007. Manticˇ, V., “Interface Crack onset at a Circular Cylindrical Inclusion under a Remote Transverse Tension. Application of a Coupled Stress and Energy Criterion,” Int J Solids Struct, Vol. 46, No. 6, pp. 1287–304, 2009. Manticˇ, V. and García, I. G., “Crack onset at the Fibre–Matrix Interface under a Remote Transverse Biaxial Load. Application of a Coupled Energy and Stress Criterion,” Int J Solids Struct, Vol. 49, No. 17, pp. 2273–90, 2012. Soni, G. Singh, R. Mitra, M. and Falzon, B. G., “Modelling Matrix Damage and Fibre–Matrix Interfacial Decohesion in Composite Laminates Via a Multi-Fibre Multi-Layer Representative Volume Element (M2RVE),” International Journal of Solids and Structures, Vol. 51, pp. 449–461, 2014. Joffe, R., “Matrix Cracking and Interfacial Debonding in Polymer Composites,” Licentiate thesis, Luleå University of Technology, Sweden, 1996. O’Dwyer, D.J. O’Dowd, N. P. and McCarthy, C.T., “Micromechanical Investigation of Damage Processes at Composite-Adhesive Interfaces,” Composites Science and Technology, Vol. 86, pp. 61-69, 2013. Bouhala, L. Makradi, A. Belouettar, S. Younes, A. and Natarajan, A., “An XFEM/CZM Inverse Method for Identification of Composite Failure Parameters,” Computers and Structures, Vol. 153, pp. 91-97, 2015. Darvizeh, M. Rahmani-Rezaieh, A. and Darvizeh, A., “Calculating the Amount of Strain Released Energy for Cracks between Fibre and Matrix in a Composite Structure by Stress Analysis,” In Persian, 16th annual conference of mechanical engineering, Kerman, Engineering school of Shahid Bahonar university,. Hosseini-Toudeshky, H. Mohammadi, E. and Mohammadi, B., "Effects of Fiber-Matrix Debonding Matrix Cracking on Mechanical Properties of Composite Laminates Using Micromechanical Approach," The 4th International Conference on Composites - Characterization, Fabrication and Application (CCFA-4 , Iran (Islamic Republic of), 16- 17 December, 2014. Barenblatt, G. I., “Equilibrium Cracks Formed During Brittle Fracture,” Journal of Applied Mathematics and Mechanics, Vol. 23, pp. 1273-1282, 1959. Dugdale, D. S., “Yielding of Steel Sheets Sontaining Slits,” Journal of the Mechanics and Physics of Solids, Vol. 8, pp. 1001-04, 1960. Kubair, D. V. Geubelle, P. H. and Huang, Y. Y., “Analysis of Rate –Dependent Cohesive Model for Dynamic Crack Propagation,” Engineering Fracture Mechanics, Vol. 70, pp. 685-704, 2003. Javidrad, F. and Mashayekhy, M., “A Cohesive Zone Model for Crack Growth Simulation in AISI 304 Steel,” Journal of Solid Mechanics, Vol. 6, No. 4, pp. 378-388, 2014. Liong, R. T., “Application of the Cohesive Zone Model to the Analysis of Rotors with a Transverse Crack,” Karlsruher Institut Fur Technologie, KIT Scientific Publishing, Karlsruhe, Germany, 2011. Belytschko, T. and Black, T., “Elastic Crack Growth in Finite Elements with Minimal Remeshing,” International Journal for Numerical Methods in Engineering, Vol. 45, pp. 601–620, 1999. Melenk, J. and Babuska, I., “The Partition of Unity Finite Element Method: Basic Theory and Applications,” Computer Methods in Applied Mechanics and Engineering, Vol. 39, pp. 289–314, 1996. Abaqus Standard, Version 6.13. Dassault systemes, Simulia. Li, S. and Ghosh, S., “Modeling Interfacial Debonding and Matrix Cracking in Fiber Reinforced Composites by the Extended Voronoi Cell FEM,” Finite Elements in Analysis and Design, Vol. 43, pp. 397– 410, 2007. García, IG. Paggi, M. and Mantic, ˇV., “Fiber-Size Effects on the Onset of Fiber–Matrix Debonding under Transverse Tension: A Comparison between Cohesive Zone and Finite Fracture Mechanics Models,” Engineering Fracture Mechanics, Vol. 115, pp. 96–110, 2014. Zhang, B. Yang, Z. Sun, X. and Tang, Z., “A Virtual Experimental Approach to Estimate Composite Mechanical Properties: Modeling with an explicit ﬁnite element method,“ Computational Materials Science, Vol. 49, pp. 645–651, 2010. Herraez, M. Mora, D. Naya, F. Lopes, C. S. Gonzalez, C. and Llorca, J., “Transverse Cracking of Cross-Ply Laminates: A Computational Micromechanics Perspective,” Composites Science and Technology, Vol. 110, pp. 196–204, 2015. Camanho, P. and Davila C. G., “Mixed-Mode Decohesion Finite Elements for the Simulation of Delamination in Composite Materials,” NASA/TM-2002-211737; 2002.